A small, deep-space probe, Shinen2, was developed under collaboration with the Kyushu Institute of Technology and Kagoshima University. 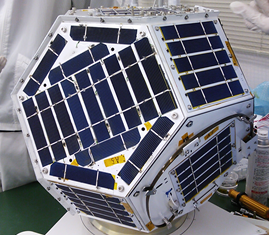 The Shinen2 was launched by an H2-A rocket as a piggyback space probe with the JAXA’s asteroid probe, Hayabusa 2, in 2014. The outer shape of the Shinen2 has a quasi-spherical diameter of 50 cm, and a mass of approximately 18 kg. An example of a deep-space probe to explore beyond the moon beyond has not been developed by any university, and no private companies exist. This paper describes the methods of the total system control of Shinen2 and compares measurement data and received data for checking the system. Besides, it shows result of radiation testing for measurement of radiation tolerance. この探査機には, アマチュア無線帯を用いた深宇宙通信の実証を目的としており, 3つの通信系統を持つ. そして, WSJT（Weak Signal communication, by K1JT）通信方式を基にした通信を行い, 超小型探査機の深宇宙通信を行う. また, 探査機の軽量化を図るため, 構造材料にCFRTP(Carbon Fiber Reinforced Thermoplastics)を一次構造として使用し, 宇宙機としては世界で初めての実利用を試みる.